AN ANCIENT AND DEADLY ENEMY. A BAND OF LEGENDARY WARRIORS. A FINAL BATTLE BETWEEN GOOD AND EVIL. When Rand Sebastian, a highly trained vampire hunter, fights Delilah, an ancient vampire, she reveals something so shocking that it nearly destroys him. But is it the truth or a lie? Then, while on a vampire hunt with Ambra, an unexpected tragedy puts Rand in a position where he must recruit others to sustain their operations. 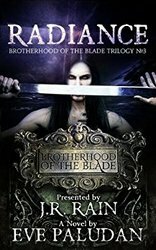 When he considers hiring a vampire to join Brotherhood of the Blade, it will set in motion a series of events that will test his leadership decisions, his fighting skills and his belief that goodness will always triumph over evil. Samantha Moon, the vampire detective, lends a hand with intel that could be the break that Rand needs to find his daughter. But the clock is ticking and he must move before the trail grows cold. On their final mission to slay the ancient vampire, Nero, the vampire hunters and Corbin the werewolf go on a journey where everything is at stake, including the future of the Brotherhood of the Blade and Sisterhood of the Scythe… and the life of a little girl.